TORONTO (Reuters) - Michael Wilson, Canada's former finance minister and U.S. ambassador, who led the negotiations on the original NAFTA trade deal, has died at 81, the University of Toronto, where Wilson last served as chancellor, said on Sunday. 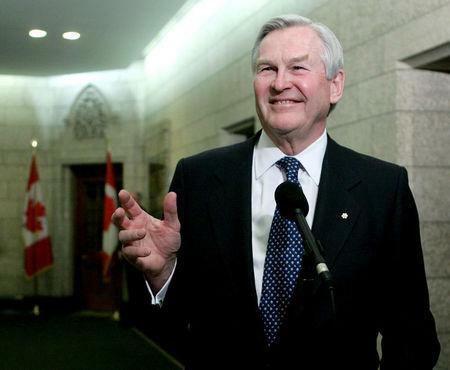 "Michael Wilson's dedicated service to Canadians - including his important work as Minister, Ambassador, and passionate advocate for mental health - will leave a lasting impact on our country," Prime Minister Justin Trudeau tweeted. University of Toronto President Meric Gertler described Wilson as a "triathlete" par excellence for his time in politics, business and volunteer work. Wilson was a mental health advocate after the death of his son Cameron from depression and suicide, and chaired the Mental Health Commission of Canada in 2015.